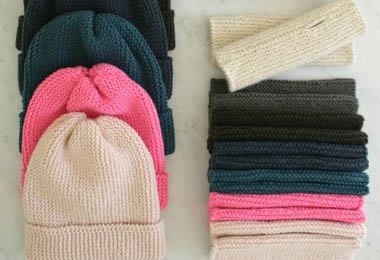 Our Simple Hand Warmers + Hat Kit teaches you how to make an adult pair of hand warmers and a hat, even if you've never knit before! You'll use two skeins of Purl Soho’s soft and lovely Worsted Twist to create simple garter stitch rectangles that you sew into shape with a single seam. From total beginners to old knitting pros, our Simple Hand Warmers + Hat Kit is pure knitting fun! 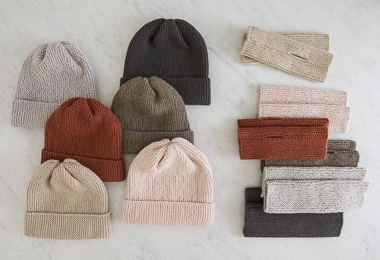 Click Product Details, above, for a complete list of this Kit's contents, and please note that this is the same as what-we-used-to-call our Learn to Knit a Hat + Hand Warmers Kit but now with a new name, new graphics, and new colors.